The Borexino neutrino detector is in Italy's Gran Sasso National Laboratory under Gran Sasso Mountain. 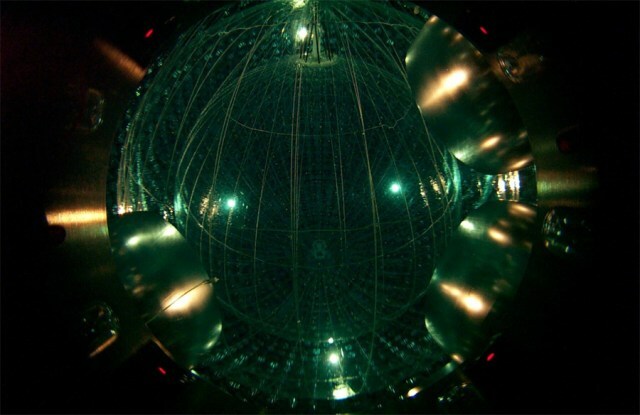 It detects anti-neutrinos and other subatomic particles that interact in its special liquid center, a 300-ton sphere of scintillator fluid surrounded by a thin, 27.8-foot (8.5-meter) diameter transparent nylon balloon. This all “floats” inside another 700 tons of buffer fluid in a 45-foot (13.7-meter) diameter stainless steel tank immersed in ultra-purified water.